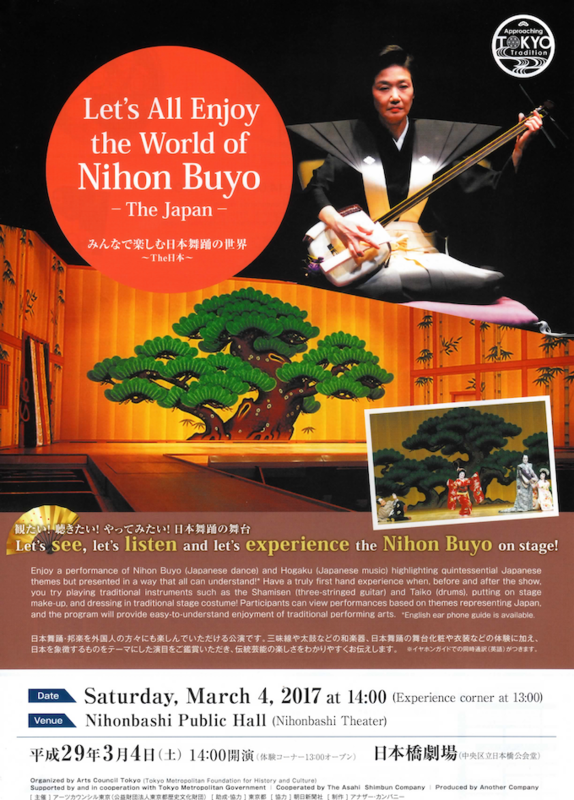 Let’s See, lte’s listen and let’s experience the Nihon Buyo on stage! 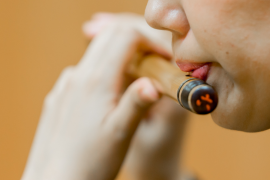 Enjoy a performance of Nihon Buyo (Japanese Dance) and Hogaku (Japanese music) highlighting quintessential Japanese themes but presented in a way that all can understand! 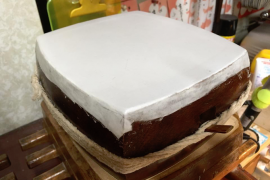 * Have a truly first hand experience when, before and after the show, you try playing traditional instruments such as the Shamisen (three-stringed guiter) and Taiko (drums),putting on stage make-up, and dressing in traditional stage costume! 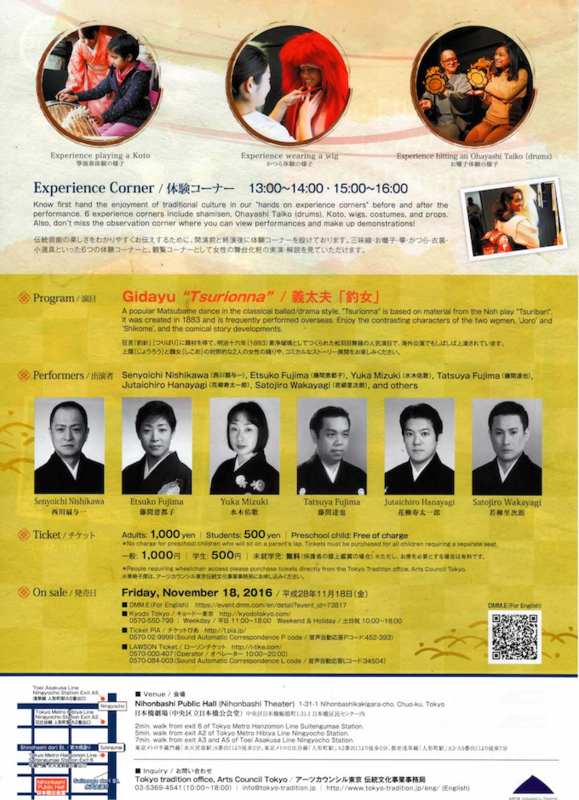 Participants can view performances based on themes representing Japan, and the program will provide easy-to-understand enjoyment of traditional performing arts. *English ear phone guide is available. Know first hand the enjoyment of traditional culture in our “hands on experience corners” before and after the performance. 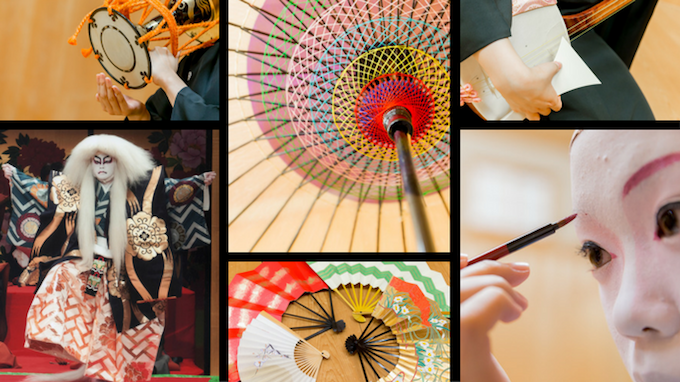 6 experience corners include shamisen, Ohayashi Taiko (drums), Koto, wigs, costumes, and props. Also, don’t miss the observation corner where you can view performances and make up demonstraitions! A popular Matsubame dance in the classical ballad/drama style, “Tsurionna” is based on material from the Noh play “Thuribari”. It was created in 1883 and is frequently performed overseas. Enjoy the contrasting characters of the two women, ‘Joro’ and ‘Shikome’, and the comical story developments. 2min.walk from exit 6 of Tokyo Metro Hanzomon Line Suitengumae Station. 5min.walk from exit A2 of Tokyo Metro Hibiya Line Ningyocho Station. 7min.walk from exit A3 and A5 of Tokyo Toei Asakusa Line Ningyocho Station. ※No charge for preschool children who will sit on a parent's lap. Tickets must be purchased for all children requiring a separate seat. 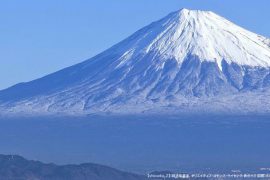 ※Peaple requiring wheelchair access please purchase tickets directly from the Tokyo Tradition office. Arts Council Tokyo.